This statistic displays the price of West Texas Intermediate (WTI) crude oil from March 2018 to March 2019. WTI is also known as "Texas light sweet", and is a grade of crude oil often used as a benchmark for oil pricing. 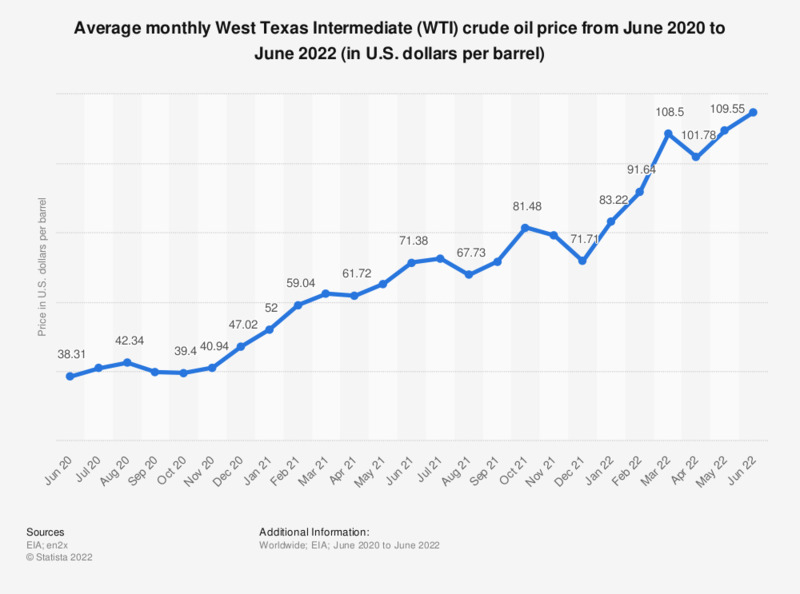 In March 2019, the price for one barrel of West Texas Intermediate crude oil stood at some 58.15 U.S. dollars. WTI is also known as "Texas light sweet" and is a grade of crude oil. This crude oil has an API gravity of around 39.6 and specific gravity of about 0.827, which, relative to other crude oils is considered “light,” hence the name. WTI also contains about 0.24 percent sulfur, making it a “sweet” crude oil. WTI is often used as a benchmark for oil pricing, making the price of Texas light sweet economically significant. The price of WTI can be compared to the prices other of crude oils, i.e. UK Brent crude oil, the OPEC crude oil basket, and Dubai Fateh oil. Prices of WTI per barrel during the period considered above were lower than those of the two other crude oils, with the price of OPEC basket oil reaching 104.45 U.S. dollars per barrel in July 2013, and the UK Brent crude oil price at 107.93 U.S. dollars per barrel in July 2013. WTI crude oil is also the underlying commodity of the Chicago Mercantile Exchange’s oil futures contracts. The recent price development of WTI crude oil relative to Brent crude oil has been influenced by variances in U.S. crude oil transportation and increased U.S. oil production per day. New transportation infrastructure became operational in the United States in early 2013, easing the movement of crude oil in the U.S. midcontinent and raising the price of WTI. Since early March, U.S. refineries have increased production of crude oil to record levels, also raising the price of WTI. Meanwhile, expedited crude transport in the U.S. put downward pressure on Brent crude oil as domestic crude replaced some imported Brent crude. Between 2014 and 2016, UK Brent prices dropped rapidly, as was the case for all other crude oils. Everything On "Oil and gasoline prices" in One Document: Edited and Divided into Handy Chapters. Including Detailed References.